Red color represents “happiness” and “joy” in Chinese culture. This probably explains why this color is usually extensively used in Chinese celebrations. We adopt this traditional cultural idea in this design. 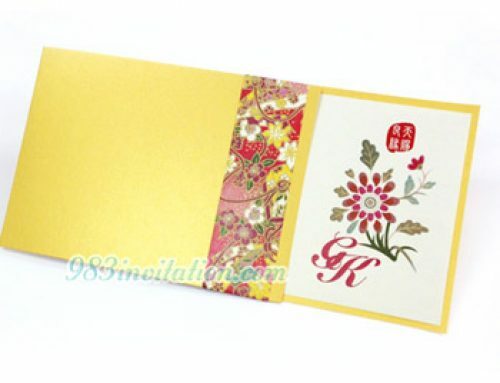 Therefore, we enrich the design of this wedding card with a red color as the main theme color tone. 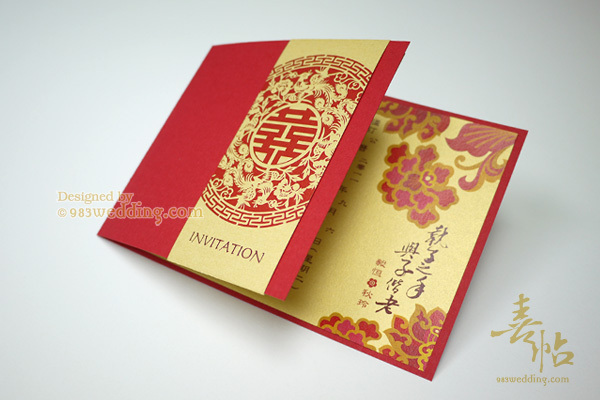 As you will know, red and gold are two main colors you will see when it comes to Chinese wedding invitations. This is especially true if it is a traditional design. We attempt to keep these traditional colors when we are creating this design. Yet, we do not just follow the traditional design ideas. Instead, we have used some modern treatment so that it becomes a modern Chinese design. 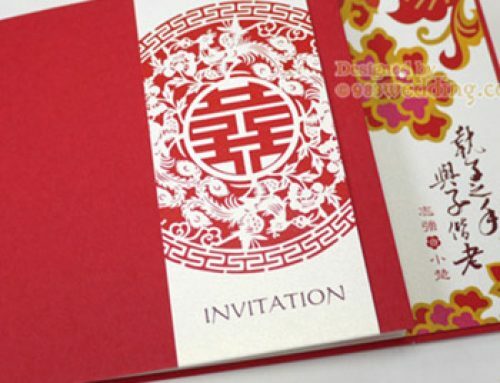 A bright red color card is used as the cover material of this wedding invitation. The color is bold. What is special about the cover is certainly the texture. The texture of the paper chosen for the cover is very exquisite. Besides the red color, there is a gold strip on the cover. It is a piece of strip with a smooth texture. So, there are two kinds of contrasts here. The first one is the contrast in color. And the second one is the contrast in texture between the two pieces of paper materials. A double happiness character is printed on the smooth gold color strip. It is a paper cutting pattern. It is not a very colorful pattern. It is a monotone pattern. The color of it is also bright red. 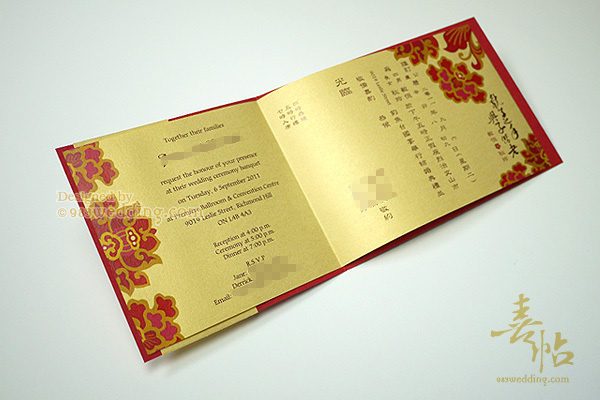 The word “INVITATION” is also printed on the gold color strip. In fact, this also creates a third subtle contrast. It is the contrast between the red print and the red color of paper. To echo the color of the strip, the insert is also gold in color. In fact, the material used is that same as the strip. 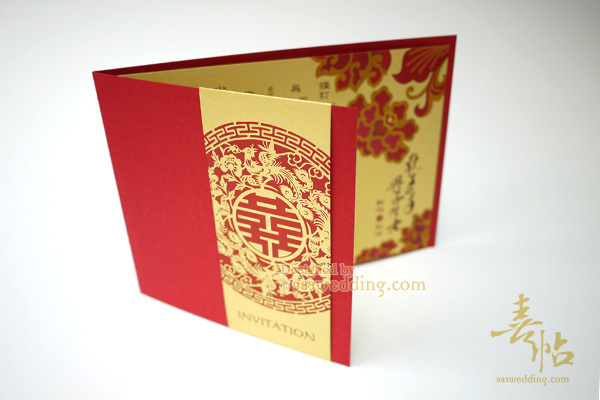 Beautiful red color patterns are printed as the border of the insert. 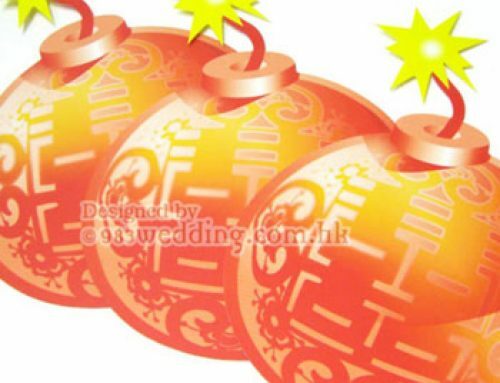 At the same time, there is also a Chinese saying on the card which means that “the couple will become old together after the marriage” (執子之手，與子偕老). This should be something meaningful for both the bride and the groom. 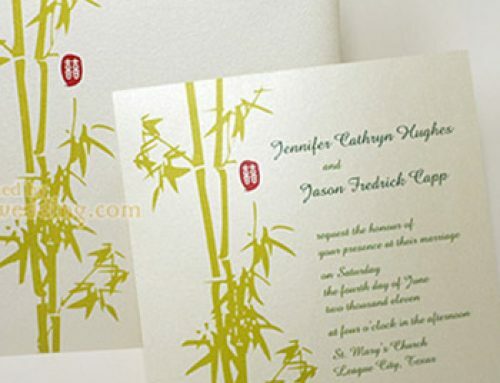 There are various ways to personalize this wedding invitation design. It is possible to change the word “INVITATION” on the cover to the names of the bride and groom! 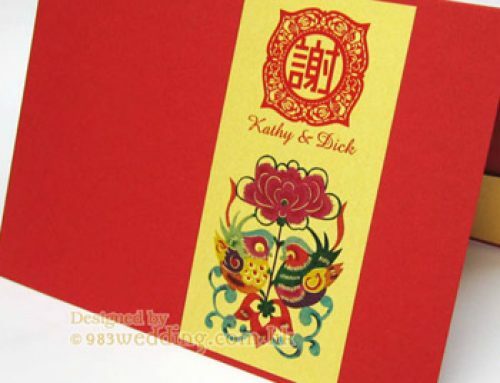 It is also possible to change the double happiness character to your wedding monogram. Of course, the design will look less Chinese when you do it. However, it will still be something stunning and exquisite.